Madrid: violent protests against Pope visit cost. Home Breaking News Madrid: violent protests against the cost of Pope’s visit. Madrid: violent protests against the cost of Pope’s visit. World Youth Day 2011: thunderstorm cut short Pope’s speech. 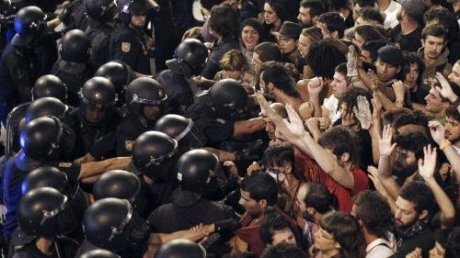 [googlead tip=”patrat_mic” aliniat=”dreapta”]Over 5,000 people took to the street last night at Madrid’s Catholic Youth Festival, violently protesting against the exorbitant cost of Pope Benedict XVI visit to Madrid, as the country faces an acute economic crisis. Protesters shouted and whistled, with even violence between them and the police. The protests are even more surprising, knowing that Spain is a country with high percentage of Catholics. According to AFP, Pope Benedict XVI visit to Madrid at World Youth Day 2011 festival cost is estimated to 50 million euro, but this amount does not include police security service and other related costs, which could increase the budget to 100 million euro. The organizers of Madrid World Youth Day 2011 festival said only 15 million euro will come from Spanish companies, while the rest will be covered by donations from pilgrims arrived at the event. The rally was attended by “indignant” M-15 movement members, who protested against the government’s austerity drive, and gay rights groups. Wearing placards with the inscription: “From my taxes, zero cents for the pope. Secular state”, demonstrators answered the call of about 140 associations for defending secularism, the progressive Christians, the militant left-wing or defense of the case gay. Some pilgrims at World Youth Day, which is held in Madrid this time, shouted “Long live the Pope!”, “This is the pope’s youth” when protesters were passing through, but police opposed the exchange of replicas to degenerate into violences. The march began in Tirso de Molina square, then reached Puerta del Sol and finally the protesters returned to where they left. Wednesday, Spanish police arrested a Mexican chemistry student for allegedly plotting to gas anti-Pope protesters at Madrid’s Catholic Youth Festival. The suspect planned to attack a march with “asphyxiating gases and other chemical substances”, according to the police. A police official said the unnamed suspect arrested was a student specializing in organic chemistry. Officers who searched his apartment seized an external hard-drive and two notebooks with chemical equations not related to his studies and a computer “allegedly used to recruit on the internet”, police said. There was no suggestion that actual chemicals had been found during the search but police had wanted to avoid even the chance of a failed attack that might panic people, according to the Spanish daily El Pais. The newspaper added that police had been alerted by people who found the man’s comments on internet forums in which he said attacks on the Pope were unacceptable. Spain is going through its worst economic crisis in decades, with the highest unemployment rate in the EU, at 21%. “We are not angry about the Pope’s visit, which some will agree with and others won’t, but rather over the financing of it with public money, especially at a time when many services are being cut because it’s necessary to curb government spending,” 15-M said in a statement. Young Catholic pilgrims attending the World Youth Day (WYD 2011) festival in Madrid are camping out in community halls and churches across the Spanish capital during the festivities. Visitors are being offered half-price travel on public transport during the festival. The festival got under way on Tuesday evening with a giant open-air Mass in an atmosphere akin to a rock concert. The government has declined to give a figure for the costs, Reuters news agency reports. Some 800 bishops, archbishops and cardinals from around the world and 8,000 priests tended to the congregation, AFP news agency reports.